Portobello mushrooms and balsamic vinegar make a savory sauce with a dramatic taste. Mushrooms are naturally rich in umami, which is the meaty, savory flavor we normally associate with protein. 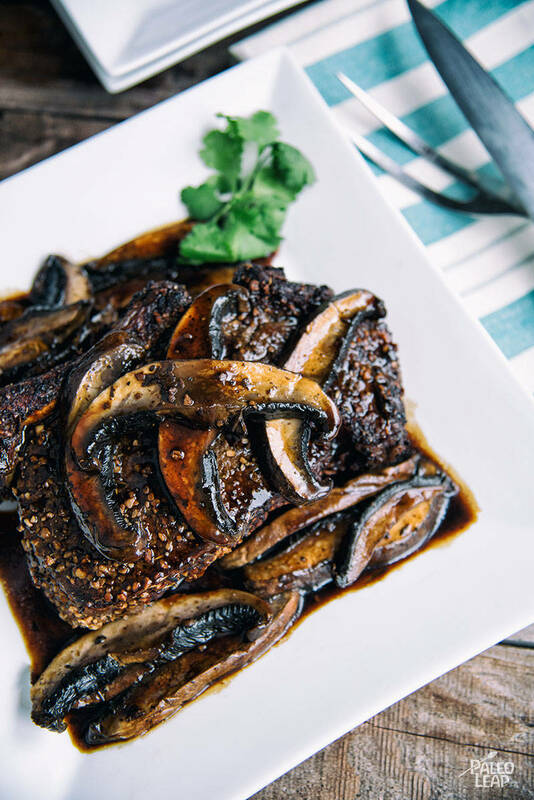 The umami in the mushrooms really turns up the natural savory taste of the beef roast, and the sharper vinegar taste gives you just a bit of contrast. Even though the cook time is pretty long for this recipe, most of that is just sitting around while the roast is in the oven. There’s not a lot of actually active work. And you can double the value of your prep time by making a slightly bigger roast so you have leftovers. The sauce here is added to the meat right before serving, so you can easily have plain leftovers to season however you want the next day. They’re great cold with some crunchy chilled pickles in a lettuce wrap! Make this one for some autoimmune-friendly comfort food. Maybe add a plate of roasted asparagus or whatever vegetable is in season in your area right now for a super-fast side and enjoy! SERVES: 4 PREP: 15 min. COOK: 2 h.
Preheat your oven to 325 F.
In a bowl, combine the garlic, onion, oregano, and salt and pepper to taste. Rub the seasoning blend all over the roast. Place the roast on a rack in a roasting pan. Roast in the preheated oven, uncovered, for about 2 hours or to your desired doneness. Take the roast out of the pan, but don’t rinse out the pan. Set the roast aside to rest for about 10 minutes. While the meat is resting, heat the roasting pan on the stovetop over medium heat. Pour in the beef stock, scraping up the bottom of the pan. Add in the vinegar and bring to a boil. Simmer until slightly reduced, and season to taste. Add the mushrooms and cook until it starts to soften. Serve the rib roast with the balsamic-portobello sauce.